Since 1997, Cement Elegance has been designing and fabricating decorative architectural and utilitarian concrete products for residential and commercial use. We handcraft unique, durable, lightweight pieces at our state of the art facility in Bend, Oregon. By applying the latest technologies of reinforcement, expedited curing, and stain protection, Cement Elegance is producing the most advanced concrete products available today. Our NatureCast concrete sinks, firepits, furniture, and more can be purchased from our growing dealer network, across the country. We are looking for new showrooms to display and sell our product in new markets throughout the country. We're offering a buy one, get one free showroom sink display to the first 4 new qualified dealers that sign up to become a new displaying Cement Elegance dealer. Please visit our booth #SL4726 in the South Hall, for more details. Cement Elegance handcrafts unique, durable, light-weight concrete sinks for residential and commerical use, at our factory in Bend, Oregon. Our Naturecast concrete sinks can be purchased from our growing dealer network, across the country. Traditional decorative concrete is poured solid, producing heavy products that crack, stain, and have many seams. Our Naturecast concrete utilizes a proprietary core and reinforcement technology (GFRC) to create large, but lightweight pieces that do not crack. Our sink products are finished with a stain-free, water-based sealer. With the sucess of this sealer system, we are able to provide a stain-free warranty, unheard of in the solid surface countertop industry. By applying the latest technologies of reinforcement, expedited curing, and stain protection, Cement Elegance is producing the most advance concrete products available today. 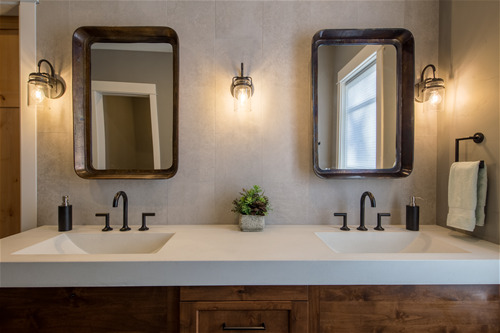 Cement Elegance concrete sinks are fully customizable and can be produced to specific requirements for residential or commerical use. The overall counter and deck sizes of any of our standard sink bowl designs can be customized. Beyond our 18 standard sink bowl molds, we can create most any custom bowl size and design that you can imagine. 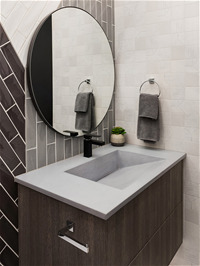 Cement Elegance concrete sinks are universally listed and meet all Universal Plumbing Codes. Our floating sinks meet ADA requirements, when installed per ADA accessiblity guidelines. For more information, please visit our KBIS booth SL4726 in the South Hall.